With Thanksgiving, Hanukkah, Christmas, New Year’s, and everything in-between, it’s easy for anybody to feel the overwhelming flush of despair in the kitchen and give in to store bought sides for that first, next, and last holiday potluck. Here is a quick and simple savory side dish. The blanched asparagus will maintain their snap and vibrant color while the spicy mustard and garlic mellow a bit when heated. And who doesn’t love bacon?! This dressing recipe has a double dose of bacon lovin’. This warm bacon vinaigrette will harmonize with your holiday spread. Asparagus is notorious for being difficult to pair with wine. If this is a consideration this holiday season, simply swap out the spears for quickly sautéed kale or spinach. 1. For blanching your asparagus: start a pot of salted water to boil over a high flame. 2. In a large skillet your bacon until crisp. Drain on paper towels. Crumble/chop the bacon and reserve. Reserve ¼ cup of the bacon fat, strained of impurities. 3. In a medium mixing bowl, combine the garlic, shallots, mustard, honey, and vinegar. 4. Slowly drizzle in the olive oil, whisking constantly to emulsify. Repeat with the bacon fat. 5. Place your dressing in a medium sauce pot and heat over a medium flame. Stir occasionally. Once heated through, remove from the flame and set aside. 6. Carefully place your asparagus in the boiling salted water. Allow to asparagus to cook for 90 seconds. Quickly drain the asparagus and pat dry. 7. 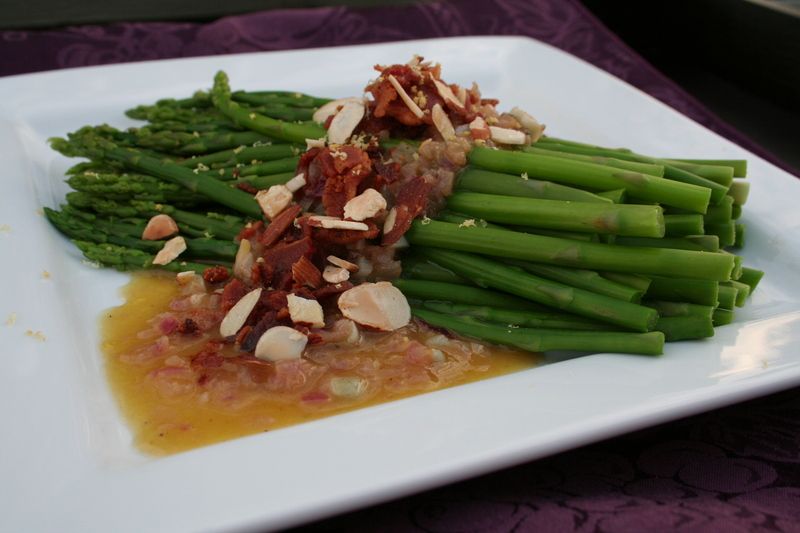 Serve: Place your warm asparagus on a platter and spoon over your warm dressing. Top with crumbled/chopped bacon and toasted almonds. Note – Make this dish ahead of time (keep the asparagus and dressing separate) and pop it in your hosts’ microwave just before serving.